Gun News & Laws / Off duty sheriff disable's suspects gun by shooting bullet down the barrel!!!! One of Marquez's bullets struck the suspect's pistol, traveling straight down that gun's barrel and disabling it. Officials say such a shot is "one in a billion." 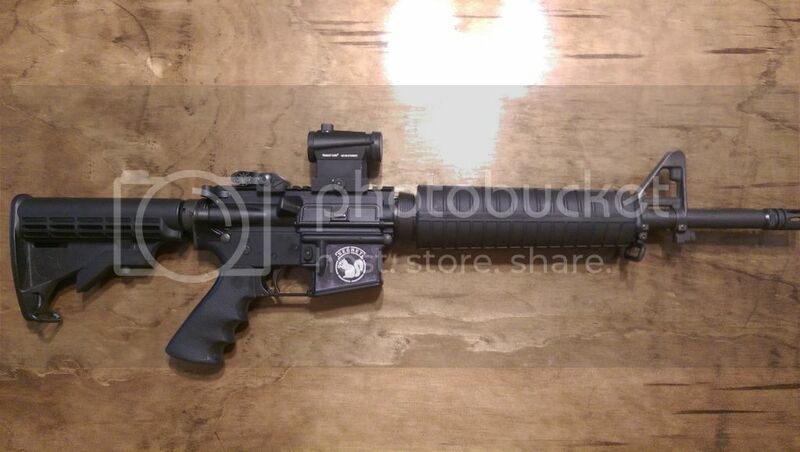 I'm getting married and am short on cash, so please buy my AR-15 so I don't have to take my fiancee through the drive through on our honey moon! 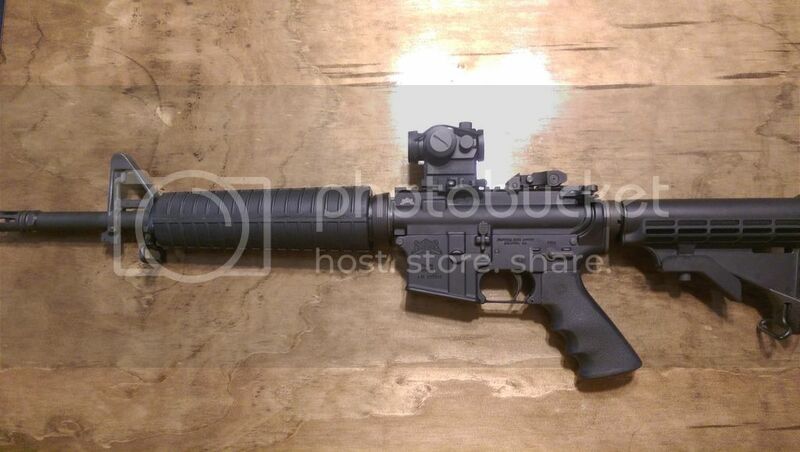 Its a Palmetto State Armory with a 14.7inch heavy profile barrel with a pinned and welded flash suppressor. This is the shortest you can go without a stamp! The heavy barrel is nice, this gun takes a while to heat up so your groups stay tighter longer. I'm also throwing in the Primary Arms MD-06 micro dot and riser, troy folding battlesight, Hogue grip, and of course the Secret Squirrel sticker. Asking 800 obo. Prefer Money order or cash. Can meet you anywhere in DFW, I'd prefer not to ship at this time. As blood soaked through Castile’s shirt, Reynolds said on camera that Castile was legally licensed to carry a firearm and was reaching for his identification when the officer started to shoot. “He let the officer know that he had a firearm and he was reaching for his wallet and the officer just shot him in his arm,” she said. The Washington Post article linked to in the NRO one I've posted has the video. I watched it... its heartbreaking. Cooke's points are good and I don't have much to add to them. Don't let anyone steal that disgust from your heart. It is a precious thing. You should treasure your disgust as a sign of your decency, particularly because hardly anyone else will. Don't let anyone tell you that the nearly uncontrollable urge to retch at the thought of this election is disproportionate, or somehow uncivil. When you contemplate the fate of your country in 2016, you have the right to be depressed, or even despairing. IMO, this is the only sane view to 2016. Seriously Jeb, I've warned you. "It was like a spider tornado hit the front seat," said the now-safe Rochester man. IWI US’ X95 features a much lighter trigger than that of the Tavor SAR. The X95’s trigger breaks around the five- to six-pound mark and will be compatible with standard Tavor SAR and aftermarket trigger packs. Look's like IWI is sick of hearing the complaints! Rifles & Shotguns / 300 BLK Tavor is here! IWI US, Inc., a subsidiary of Israel Weapon Industries (IWI) Ltd., is proud to announce a new caliber for the TAVOR® SAR; the .300 Blackout. And as a conversion kit! The .300 Blackout conversion kit includes a 16.5” or 18” cold hammer forged chrome lined barrel made of CrMoV steel with a 1:7 right hand twist, a headspaced bolt, an A2 flash suppressor and barrel wrench. MSRP is $499.00. "Even if we’re generous and presume that every single one of these regulations finds its way permanently into the law, he will nevertheless have done nothing substantial to further “universal background checks”; he will have instituted none of his coveted magazine limits; and he will have banned none of the weapons that he disdains. Further, he will have set no meaningful precedents whatsoever. In other words: Even if he wins this round, he will have done precisely nothing of merit — except perhaps to have pleased his base and to have convinced the most ignorant parts of the electorate that he has finally stuck his finger into the NRA’s eye. Were these serious measures, I would be squealing. Instead, I’m amused. These are the dampest of squibs." Rifles & Shotguns / Just ordered a geissele trigger for my Tavor! So, I'll still defend the stock trigger as being pretty good for what it is... but Primary Arms had a sale so I just ordered myself a Geissele trigger for my Tavor! Probably won't get here before Christmas, but I'm looking forward to giving it a shot! Off Topic Discussion (NON FIREARM RELATED) / I'm engaged! I proposed to my girlfriend over the weekend and she said yes! General Gun Discussion / Good range in DFW? Anyone in the DFW area know of a good outdoor range? I'd like to find a place that's rapid fire friendly. Bonus points if they have steel targets. Anyone ever do the online CHL renewal? Any idea how long it takes? I just submitted mine. Dude needs to take his book money, buy some land in Alaska, and chill out in a cabin for like five or ten years until everyone forgets who he is. Off Topic Discussion (NON FIREARM RELATED) / I'm alive! I've not been on much because I just moved to Dallas and then before I was even un packed my company flew me out to Israel for 8 weeks of training. I've not been posting here much lately because I'm in the middle of moving to Irving. Anybody here from that area? I'm trying to figure out which electric companies and ISPs to go with. If you have any suggestions about who to go with I'd love to here them! Zip code is gonna be 75060 if that helps. And my internet seems to be a choice between Time Warner Cable, AT&T, and Verizon. TL;DR: USPS wasted 45 minutes of my time and I'm done with them forever. I'm so sick of them lacking anything even remotely close to customer service. Situation: I'm shipping brass I sold. I'm in line with a used amazon prime box with the old label still on it. Not a problem though right? Its super easy to put the new label over the old label right? This is how normal people think right? Get to the post office, there's a huge line. Mar mar mar, ok, fine, its the post office. There are two people at the counter. Twenty minutes later, I'm third in line and one of the two people is dealing with someone who's taking a really long time. The other one goes on break. Ten minutes after that, the guy in front of me is up. He prepaid and pre-printed a label. It is not taped to the box. He gets up there and the woman informs him that he underestimated the weight by the cost of two stamps. Also he needs to tape the label to the box himself. He says he has no tape. She says he either has to leave or buy tape from the post office. He chooses to leave. My turn. I have a box and an address. She informs me I have to remove the existing label or they can't ship it. Seeing as the label is under the tape and I just saw her turn away a guy for not buying tape, I ask why she can't place the new label over the old label. She says she can but it'll cost more. I'm thinking, "what?" Anyway, after 5 questions and her super short and unhelpful answers I ascertain that my options are remove the label and write the address right on the box OR pay for priority shipping to get a priority label to put over the old label. Apparently USPS is so backwards they don't have label technology that doesn't come attached to specific shipping options. I mean, I can walk into a UPS store, give them an address, and they print a label for me and tape it to the box. Sure, it costs more, but it doesn't take freaking 45 minutes of my time and there's no possibility of being turned away for not crossing my t's or dotting my i's! So I walked away and am going to UPS later today and I'm never voluntarily stepping foot into a USPS again. Meet and Shoot is postponed due to weather and attendance. What: Meet & Shoot! Grab your guns and come on down! When: January 11th, 2015. Time TDB, but probably 10ish until people have to leave. Who: You, your friends, your wife, so long as they can handle a firearm safely feel free to bring 'em along! Why: Hanging out with cool people while shooting neat guns. Need I say more? What I need from you: Hey guys, I'm going to take point on this. What would really help right now is if you can post below that you are going and how many you are bringing with you. If we have fifteen or more guys I'll see about getting some kind of discount from Gun Corps. That's it! Just let me know you're coming. Also feel free to setup rides in this thread. Range info: Gun Corps's range is outdoors and has minimal rules. Basically as long as you don't do anything to make the RO think you're an idiot you can do what you want. They are rapid fire friendly, so long as they aren't concerned you're missing your target. Range fee is $10 for all day* pistol/rifle. Add $5 if you want to shoot steel. Pistol bay is up to 25 yards, rifle range is 100 yards. They also have 5-Stand for $10 per round (25 clays). *They do say that its for 2 hours unless there isn't a wait list. I have never seen them busy enough to have a wait list. Last Sunday I practically had the range to myself. 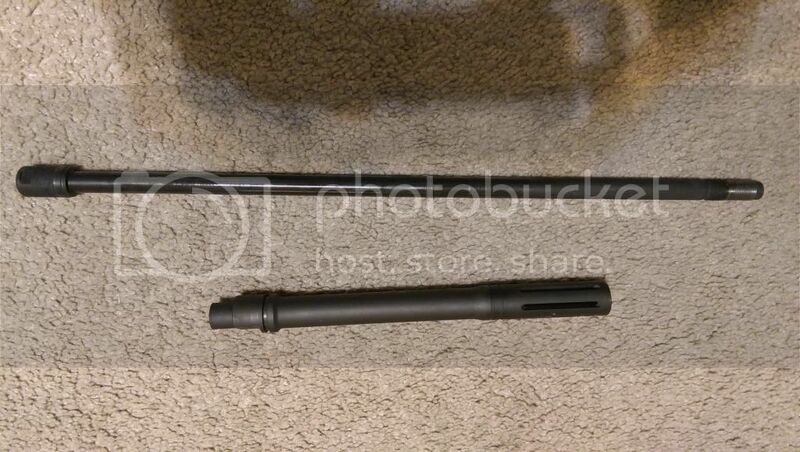 FIREARM ACCESSORIES / WTS in B/CS: 16in PS90 barrel and shroud - SOLD! 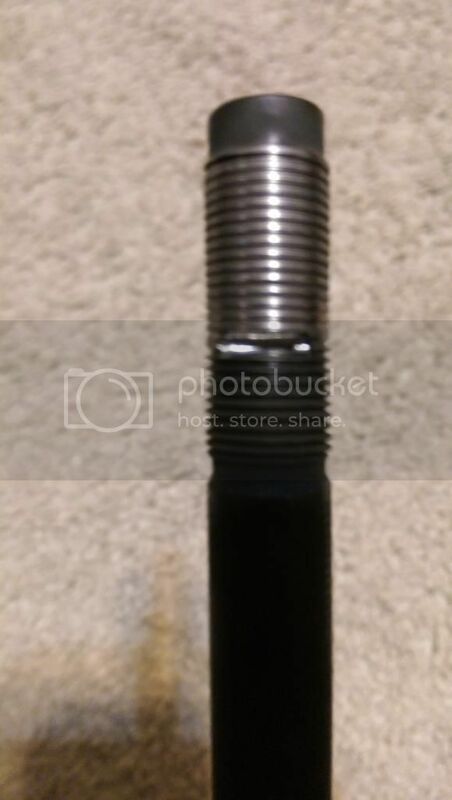 On the off chance any of you need a PS90 barrel and shroud I have just the thing you're looking for! $250$200 $150 paypal or USPS money order. Can ship if need be. More pics available upon request.